Map point: Camp Wheeler, which was named in memory of him. Occupation and residence at time of enlistment: He was a stock clerk in Hamilton, Ontario. He was also a Boy Scout Troop Leader with the Hamilton 26th Scout Group. Notes on war service: He served in Canada from November 1943 until he was shipped to England in June 1944. From October 1944 until his death six months later, he saw action in the northwest Europe theatre of war. 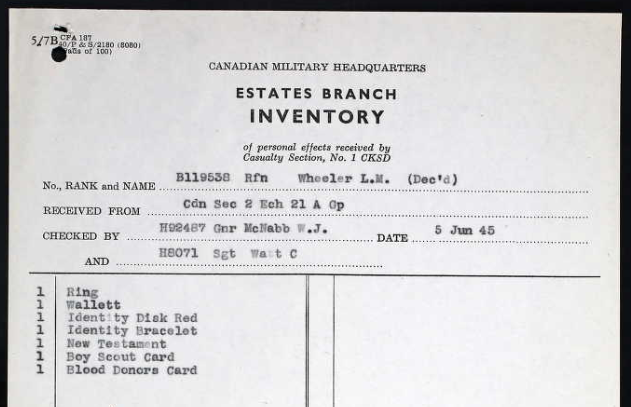 Information source: Library & Archives Canada WW2 Service Files of War Dead, Ancestry.com images.